Russia has warned the US-led coalition fighting in Syria that it will view its aircraft as targets, after the US shot down a Syrian military plane on Sunday. The coalition said the Syrian Su-22 had bombed US-backed fighters battling so-called Islamic State in Raqqa province. Russia, the Syrian government's main ally, also said it was halting communications with the US aimed at preventing such incidents. The White House says it retains the right to self-defence in Syria. Spokesman Sean Spicer said it was important to keep lines of communication open with Russia. 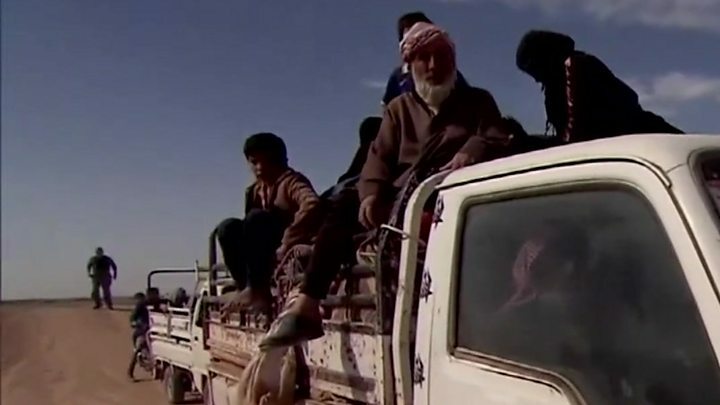 It comes at a time when the US-led coalition and the fighters it is supporting on the ground attempt to oust IS militants from the city of Raqqa, the de facto capital of the "caliphate" they proclaimed in 2014. "Any aircraft, including planes and drones belonging to the international coalition operating west of the River Euphrates, will be tracked by Russian anti-aircraft forces in the sky and on the ground and treated as targets," the Russian defence ministry said. However, it stopped short of openly saying it would shoot down coalition aircraft. Reuters news agency quoted a US military spokesman as saying it was repositioning aircraft over Syria in the wake of the incident, to ensure the safety of American crew members. What about Russia-US co-ordination in Syria? Russia also denied the US had used a communications channel before the Su-22 fighter bomber was shot down, and said it was ending a memorandum of co-operation with the coalition aimed at preventing air incidents and guaranteeing flight safety. But the chairman of US military's Joint Chiefs of Staff, Gen Joe Dunford, said it was seeking to re-establish the "deconfliction" communications line with Russia, adding that it had remained in use "over the last few hours". It is not the first time communications have been suspended between the two sides - in April, the hotline was shut down after the US launched 59 Tomahawk cruise missiles at Syria's Shayrat airbase in response to a suspected chemical weapons attack on a rebel-held town in Idlib province. The US and Russia had agreed to resume communications last month. UK Prime Minister Theresa May called on Russia to continue using available measures to "reduce the chance of misunderstandings over what is a crowded airspace", Reuters reported. Russia's ministry of defence has responded sharply. In addition to the usual rhetoric - the charge that the US is violating Syrian sovereignty and breaking international law - there is a practical step - the immediate suspension of the co-ordination channel set up to avoid clashes between US and Russian forces. There is a threat too, namely that in areas where Russian aircraft are operating, coalition drones and aircraft west of the Euphrates river will be tracked and "treated as targets". It should be noted that the co-ordination mechanism has generally worked well and its operation is as much in Moscow's as Washington's interest. A previous "suspension" of the mechanism by Russia seems to have been by word only - behind-the-scenes contacts continued. But as the battle for eastern Syria steps up, Russia and its Syrian government ally seem intent on drawing a line in the sky. How did the US justify downing the jet? 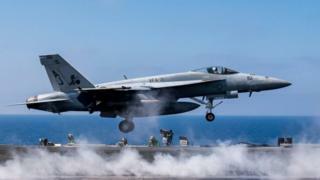 The Su-22 fighter bomber was engaged by an F/A-18E Super Hornet after it dropped bombs near the town of Tabqa in Raqqa province on Sunday afternoon, the Pentagon said. It is believed to be the first air-to-air kill of a manned aircraft by a US military jet since the Kosovo campaign in 1999. The US-backed Syrian Democratic Forces (SDF), an alliance of Kurdish and Arab fighters who are leading the offensive on Raqqa, were operating in the Tabqa area. A statement from the coalition's Operation Inherent Resolve said pro-government militiamen had attacked SDF units, driving them from the town of Ja'Din. The coalition conducted what it said was a "show of force" - a reported buzzing of the pro-government troops by jets - to stop the attack and then called Russia to try to "de-escalate the situation and stop the firing". However, the Su-22 dropped bombs on SDF positions a few hours later, the coalition said, and "in accordance with rules of engagement and in collective self-defence of coalition-partnered forces [the plane] was immediately shot down". Attempts to warn the plane away using an emergency radio frequency failed, the US military's Central Command said. Both Russia and Syria say the warplane was on a mission against IS about 40km (25 miles) south-west of Raqqa, when it came under fire. Russia said in its statement that the Syrian pilot had ejected over IS-controlled territory and "his fate remains unknown". Syria's army said the "flagrant attack" would have "dangerous repercussions". Despite Hollywood blockbusters showcasing close-range aerial battles, they have almost vanished from modern warfare. "The era of dogfighting is largely over," says Justin Bronk, a research fellow at the Royal United Services Institute, specialising in combat airpower. "After the totally lopsided kill-to-loss ratio attained by the US Air Force and US Navy during the First Gulf War, it is a very rare thing for regimes under attack by the US and its allies to send fighters up in defence - since they know how it will end." Is it the first time the US has engaged with the Syrian military? Separately on Sunday, Iran's Revolutionary Guards said they had launched several missiles into eastern Syria, killing a "large number" of IS fighters. They said it was in response to an IS-claimed attack on the Iranian parliament earlier this month which killed more than a dozen people.